Continuing my drive to watch all of Black Mirror in anticipation of series 4 I have recently polished off series 2 that like the first series is just three episodes long. Much like the first series it contains within it one of the best episodes the entire show has aired, the special blend of harrowing and soul destroyingly terrifying. First episode is Be Right Back that has a sci-fi bent to it. After Martha (Hayley Atwell) loses her husband Ash (Domhnall Gleeson) in a car accident she is distraught, in her grief she decides to use a new online service that allows people to stay in contact with the dead. The service pulls together all the online presence of the deceased in order to make a virtual duplicate. Martha uses this intensely and one day is told there is a next stage in the service. An android that perfectly replicates the look of Ash is delivered but due to the limits of its programming it makes Marta uncomfortable with the lack of any real personality. This episode reminded me a lot of an Outer Limits one I saw back in the day, I fully expected this to go a similar route with the android turning psychotic but instead there is the more measured bleak outlook. With your loved one still there albeit virtually you can't actually really ever get over the death as you're deceiving yourself. There is the general age old message of 'be careful what you wish for' that was explored well and was suitably depressing, but for me this episode just never hung around in my mind too long. The second episode White Bear is the episode I would show if someone wanted a taste of exactly what Black Mirror is, it still haunts me to this day. A woman wakes up in a house with complete amnesia, going outside she sees people all filming her on their phones, and who ignore her cries for help. After being attacked by a masked man with a shotgun she meets up with another seemingly normal person who informs her a mysterious television signal started playing one day that brainwashed the majority of the population into becoming passive voyeurs, and that sadistic people known as hunters kill other uninfected for sport. She learns that there is a transmitter at "White Bear" station that will stop the nefarious broadcast, and so she heads there hoping to end it all. This is just such a messed up episode, to say much more would spoil it, needless to say I did not see the ending coming and it provides such material to dwell on years after watching it, this is still something I think about; Charlie Brooker at his most stunning. Interestingly originally this was going to be a zombie apocalypse story but was made into this that deals with karma and perverted justice. Final episode is a political one, much like the first episode of series 1 was, and like that one it predicted a real world event. 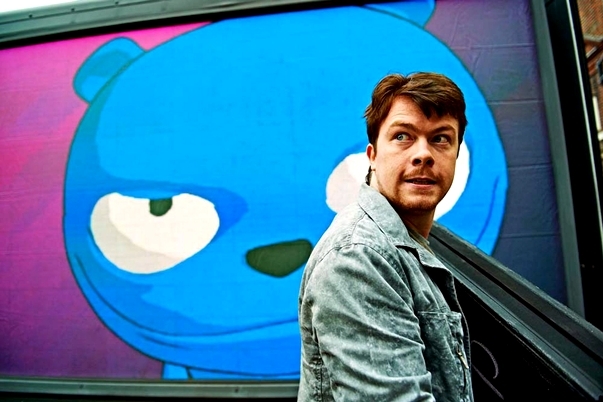 The Waldo Moment stars Daniel Rigby as Jaime Salter; a depressed failed comedian who performs the voice and movements of a popular adult focused cartoon bear named Waldo. While filming material for a new show the producers come up with the idea to have Waldo compete for an upcoming by-election in Stentonford. Jaime wants nothing to do with politics but finds himself drawn in to it by his bosses. After the fact this episode became quite interesting as an analogy to the rise of Donald Trump. Like Trump Waldo is larger than life, vile and rude, more interested in insulting the other candidates than have any real message. The cartoon of Waldo looked pretty cool and attained an unsettling vibe, but mostly this felt more grounded in reality than the others this season. While I enjoyed the this well enough its mid credits zinger felt pretty silly and unbelievable and brought down the tone by featuring a weird dystopian setting that was at odds with the normalcy of the rest of it. Another three episodes with again one absolutely fantastic one and two that were good in their own way, but which paled in comparison to the high end of what Black Mirror can achieve. White Bear may just be the very best episode of the show though, and so for that reason alone this series is worth seeing.